The wettability of oil reservoirs is the most important factor controlling the rate of oil recovery, providing a profound effect on petroleum production. 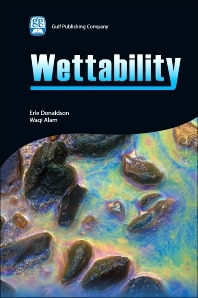 The petroleum industry has increased the research effort on wettability, but, so far, there has never been a comprehensive book on the topic. This is the first book to go through all of the major research and applications on wettability, capillary pressure and improved recovery. Critical topics including core preservation, the effect of wettability on relative permeability, surface forces such as van der Waals equation of state, petroleum traps and pore size effects are all included in this musthave handbook. Deciphering the techniques and examples will increase the efficiency and production of oil recovery, translating to stronger reservoir simulations and improved well production. Erle C. Donaldson is an independent consultant and managing editor of the Journal of Petroleum Science and Engineering. He was elected to the International Hall of Fame for Science in 1993. He has received a distinguished service award from the Republic of Honduras and other honors from the U.S. Department of Energy, the National Petroleum Engineering Honor Society, and the University of Oklahoma. Dr. Donaldson has written, co-authored, and served as editor on numerous articles and books.